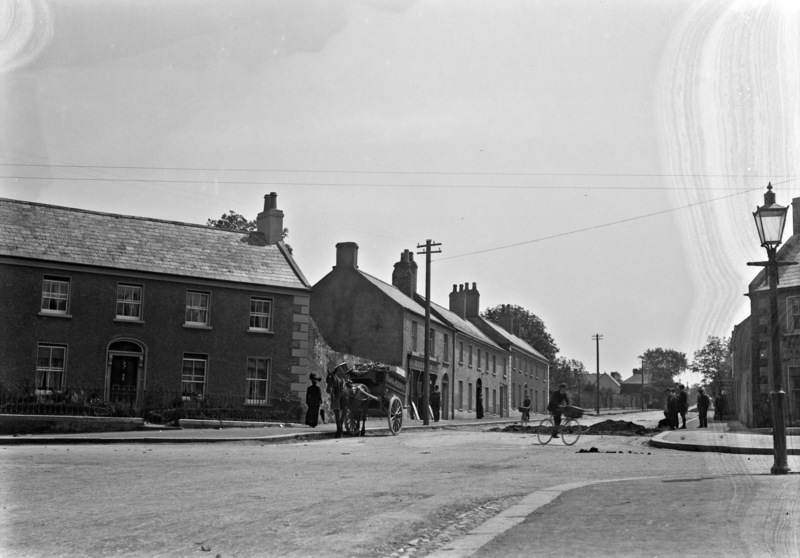 There seems to be a hole in the road and there seems to be at lease four men looking into it, so not much has changed in Ireland over the last 100 years! Our catalogue directs us to the suburban town of Malahide which is to the North of Dublin, is the catalogue correct? Date: Catalogue range c.1900-1939. Likely in first decade or two of range. Perhaps c.1910s. It's taken from one corner of the Diamond, looking up Church Road. Malahide Heritage have this photo (with printed caption) on one of their pages on old shops in Malahide. (It’s quite far down the page). The house on the left used to be Maurice Mahon's shop when I lived there in the 70s and 80s. I always wondered why they were digging the road....electricity or sewage? I see they finished the roadworks! [https://www.flickr.com/photos/[email protected]] And they swept up the horse apples! Streetview 2017. Ah, the Beachcomber got there first! Date-wise, I'm going for pre-1914, possibly nearer 1900 than 1910. The ladies fashions put us at the beginning of the date range, say 1910. Bolands bakery no help - in existence a long time by then. I see Richard Harford, Ship Broker, in the 1911 census, but in 1901 he was not in Malahide. Presumably the posters are for sea voyage deals. I can see cable in the hole, maybe pull through. This Eason shot in the archive EAS_1867 is looking East through the same junction, fashions are similar. The Post Office has a Telephone sign out. EAS_1866 is a reverse view. If I might be allowed to stray beyond the Eason series of Malahide, the following shot is EAS_1874 of Doyle's Corner, and includes newspaper posters. The Irish Times and Freeman headlines begin ASSASSINATION OF ... HEIR TO THE THRONE... Could it be Franz Ferdinand, the kick-off to WW1? I think so - reported in the IT Monday 29th June 1914. So I think we are before that date here today. [https://www.flickr.com/photos/gnmcauley] Ah. I see you've done the same trawl of the census I did. Maybe I should read the comments first. [https://www.flickr.com/photos/gregcarey] What did Mahons sell? [https://www.flickr.com/photos/bultacofan] [https://www.flickr.com/photos/gnmcauley] Pre 1914, I would go along with that suggestion. [https://www.flickr.com/photos/abandonedrailsireland] The cable escaped me in the first instance, but I think I can see it now. [https://www.flickr.com/photos/nlireland] They were basically a newsagent, but had e.g. a small collection of toys. [https://www.flickr.com/photos/[email protected]] I have found to my cost many times that it is always worthwhile to read the comments first!! [https://www.flickr.com/photos/scorbet] Sharon why has your PRO got a red line under it whereas others have an outline around theirs? I know you are a VIP, but? [https://www.flickr.com/photos/nlireland] Newspapers, stationery & confectionery. They had a toyshop upstairs for a while. [https://www.flickr.com/photos/nlireland] If you mouseover Sharon's PRO badge, you see hovertext saying Flickr Heart Our Old School Pros. [http://www.flickr.com/photos/[email protected]/] [http://www.flickr.com/photos/[email protected]/] You can choose which you want in the settings somewhere. [https://www.flickr.com/photos/gnmcauley] [https://www.flickr.com/photos/scorbet] I see! I like it! [https://www.flickr.com/photos/bultacofan] Regarding your note, saying Bolands but not the bakery - in the archive using megazoom you can make out on the side of the cart: MALT & VIENNA BREAD, so I think this is a Boland's Bakery cart.